Looking for a way to get your children interested in food and cooking…then this is the book for you? Marco the Little Chef will take you and your kids on an adventure to find the ingredients needed to make a delicious homemade macaroni and cheese meal for the whole family. 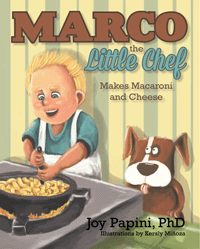 Throughout their journey, Marco and his dog, Pepperoni, travel all over the world learning about where different types of pasta and cheeses originated and how they are made. 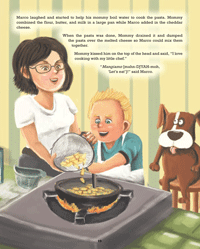 Marco ends his adventure by helping Mommy make Macaroni and Cheese for a family dinner. When the reading is done the cooking lesson can begin with a complete recipe for making homemade Macaroni and Cheese with your own little chef. The best part is that the story ends with a full and happy tummy for all. 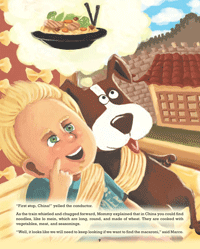 A fun and educational food adventure that will bring out the little chef in everyone! 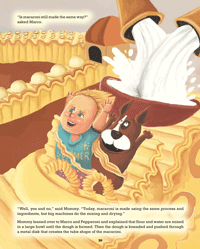 Join Marco and Pepperoni on their worldwide quest to learn about making the perfect macaroni and cheese!